My grandfather left Sweden and traveled to America on his own when he was a teenager, and over the course of a few years, he and four of his siblings settled here on the North Shore. This means that there are quite a few of us still lurking about that were brought up to embrace our Swedish heritage, and we enjoy serving traditional foods when we gather over the holidays. Each year before the family fracas, I make a pilgrimage to Worcester to procure Swedish goodies, but this year, I was running short on time. 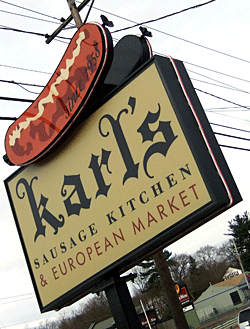 I had heard Karl’s Sausage Kitchen in Saugus had some Nordic specialties, so I decided to investigate. If you are not familiar with Karl’s, it is a wonderland of meaty treats that has been around since 1958, consistently wins accolades, and was even mentioned by Robert B. Parker in one of his Spenser books. A few years ago, the shop was taken over by Robert and Anita Gokey, whose dedication to quality is obvious upon tasting their products. They hand make most of the sausage on site and operate their own smoke house. They chop the meat and spices in lieu of grinding and never use fillers or MSG. 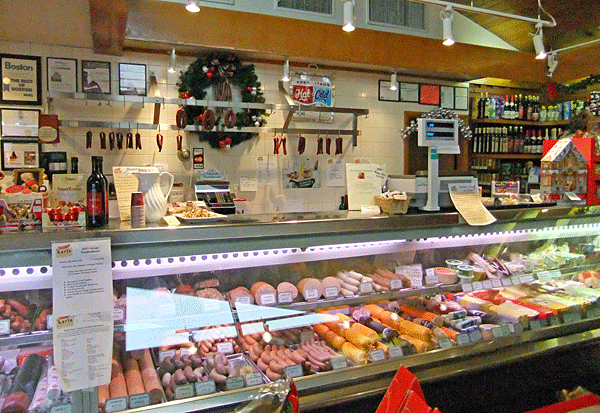 In addition to the deli cases chock full of gorgeous meats and cheeses, their shelves are overflowing with European specialty foods of every description. I am happy to report that I found what I was looking for. Karl’s offers medvurst, a Swedish soft salami that they had make in-house, and it is excellent—perfectly spiced and not greasy ($11.49/lb) They have house-made kok korv and potato sausage, which I’ll have to return for. They also have house-made Limpa (Swedish rye bread) with a light caramel-y crust and a hint of caraway that is delicious. Swedish cheeses include Herrgords Orst ($11.29/lb) and Bond-Ost ($9.59/lb) among others. I also picked up pickled herring, crisp bread, and Swedish gingersnaps. While I didn’t need lingonberries, I was impressed at their selection, which is right next to the cloud berries, pickled beets, Julmust, and Glogg (non-alchoholic, we make our own high-octane version at home). 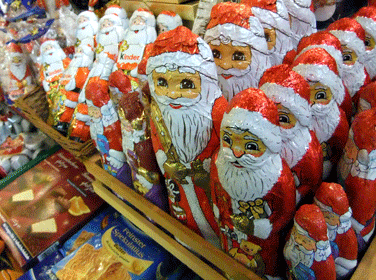 Karl’s is currently decked out for the holidays with all sorts of festive confections; German, Swiss, and Belgian chocolates; a huge variety of Stollen and cookies; adorable marzipans; and a cavalcade of Kinder novelties. And for those getting into the Christmas spirit, think about stopping by this Sunday (12/5) for Karl’s Annual Christkindlmarkt. You can shop for gifts, sample traditional foods, and experience the atmosphere of a German Christmas Market. I’m thinking I may have to become a regular at Karl’s. Not just for the Swedish specialties, but because I want to try all of that fabulous hand-made sausage. 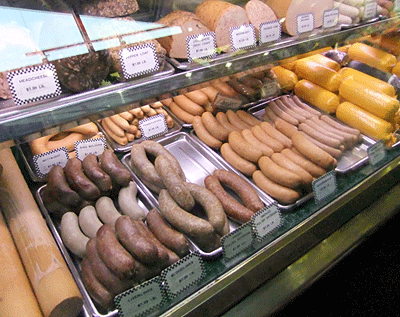 There’s so much there, from bratwursts to andouille and chorizo, not to mention the smoked meats and cold cuts—it’s a project that could take years.